Welcome to the St. Charles Police Department webpage. Our mission is to safeguard life and property, preserve the peace, prevent crime, enforce the law and protect the rights of all citizens. We are committed to working in partnership with the community to identify and resolve issues that impact public safety. Our department currently consists of six full-time and four part-time sworn Peace Officers who faithfully adhere to our core values of Pride, Respect, Integrity, Dedication and Excellence. We are committed to building strong relationships with our community. Please follow us on Facebook for information and important community announcements. Ken Frank officially began serving as Chief of Police for the City of St. Charles on July 29, 2013. 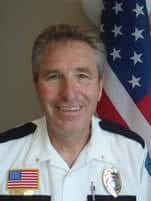 Chief Franks comes to St. Charles after serving as the Chief of Police of West Concord since 2007. Frank brings over 25 years of experience of law enforcement experience to lead the department.